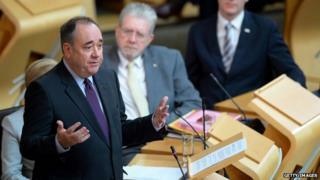 First Minister Alex Salmond has urged Scottish voters to grab the opportunity of independence with "both hands". Speaking in a parliamentary debate exactly a year before the referendum on Scotland's future, he said people living in the country were best placed to make decisions about it. On 18 September 2014, they will be asked the yes/no question: "Should Scotland be an independent country?" The SNP's opponents said Scotland was stronger as part of the UK. Opposition parties who support the Union - Labour, the Conservatives and Liberal Democrats, as well as the Westminster government - said Scotland, with a devolved parliament as part of the Union, benefitted from having "the best of both worlds". Speaking in the Scottish Parliament, Mr Salmond said: "We are a country rich in natural resources, with world class universities, an outstanding visitor industry, expertise in engineering and life sciences, an astounding cultural heritage and a skilled and inventive people. "Independence lets us build on that. We gain the chance to make Scotland fairer, unhindered by a Westminster system which has created one of the largest gaps between rich and poor in the developed world." Alex Salmond knows to steer clear of Braveheart rhetoric. He knows that, while it might enthuse the fervent, it can also tend to deter the undecided or the wavering. Of whom, there are plenty. So his contribution was to argue for independence as part of a continuum: a development of existing devolved powers into all areas of public life. Again, an effort to reassure the fretful. Mr Salmond argued that devolution had shown that Holyrood could take sensible decisions in line with the consensus of Scottish thinking - under former administrations as well as his own. That, he said, argued for full independence with all decisions affecting Scotland best taken by the people who live there. It was, he said, "a common sense position based on experience." Nothing to fear. Mr Salmond said, under independence, Scotland would gain control of welfare, borrowing, economic regulation and taxes, and energy policy. At the same time, he said, the country would gain its own voice in the United Nations, Nato and the European Union. The first minister also said independence would address a "democratic deficit" brought about by Westminster governments and parliaments which had brought in policies opposed by Scottish politicians. He told MSPs: "Independence is about giving ourselves the power to make our country as good as it can be; it's about the right to decide, the ability to make choices. "And this government's argument - our fundamental, our most important contention - is that the people who live and work in Scotland are the people most likely to make the right choices for Scotland. "It is not an argument that is subject to statistical manipulation, it is not an argument for a day's headlines, it is not an argument born of fear. It is a common sense position based on experience." He added: "That is why independence is the best route not just to becoming a more prosperous country but to becoming a more just society. And that is why - exactly a year from today - the people of Scotland will claim that opportunity with both hands." The Scottish government's detailed case for independence will come in a white paper to be published in the autumn which has promised to "answer all the questions people reasonably have". But Scottish Labour leader Johann Lamont said that kind information should be made public sooner. She said: "It's because I'm a proud Scot, not despite it, that I support Scotland remaining strong in the United Kingdom. "My head tells me it's right, but my heart cries out for co-operation and not division." Ms Lamont said of the SNP's vision: "The truth is this - regardless of the economic circumstances, on high days and holidays, in good times and bad, the SNP hold on to their belief in independence. "It's not a response to the banking crisis, not a response to foreign wars, not a response to a Tory government - it is the politics of nationalism looking for a justification for a belief held when all else changes, regardless of what the evidence says." She told Holyrood: "The SNP say they speak for Scottish values, but the values of community, of co-operation, of being a good neighbour, of solidarity, are embodied in the United Kingdom, not repudiated by it." Opposition parties claimed the SNP government had watered down its vision for independence to increase support among voters during a time when polls were indicating most people backed the Union. They pointed to SNP policies such as keeping the pound and the services of the Bank of England under a "currency union" with the rest of the UK, and retaining the Queen as head of state. Scottish Conservative leader Ruth Davidson said an independent Scotland would be forced to create a "poor facsimile" of UK-wide institutions which already existed. "The Parliament agrees that Scotland has an abundance of resources and talent and can more than afford to be a successful, thriving independent country; notes that successive UK administrations have pursued an economic policy that has led to the UK having one of the most unbalanced and unequal economies in the developed world; agrees that it is wrong and costly for policies to be imposed on Scotland that have been overwhelmingly rejected by Scotland's political representatives, and welcomes evidence that shows that there are gains for families and communities when decisions about Scotland are taken by those who care most about Scotland, the people who live and work here." She said: "I believe in ensuring the greatest opportunity and prosperity for people in the future." Ms Davidson argued the UK economy had withstood the economic shocks which had resulted in serious consequences for other European nations, while also being capable of long-term growth. "We have prospered through our partnership with the other home nations and we continue to do so," she said. "The first minister likes to convey a sense that, under independence, everything would change but nothing would change. "If we were to leave the United Kingdom, it would inevitably mean different rules on sides of the border. Different financial regulations, different employment laws, different insurance requirements, different tax authorities, different accreditations and qualifications which small companies would be obliged to contend. "These are all barriers to trade, they're all obstructions to economic growth they're impediments to job creation in Scotland that we all want to see." For the Liberal Democrats, MSP Tavish Scott said many doubted whether the government's independence white paper would have all the answers, adding: "The one certainty is uncertainty." "On every area of policy, independence is a walk in the dark. It is opening a door into a pitch black room and trying to find the door on the other side. We may never come out." Mr Scott continued: "But the one certainty is, the door marked UK will be locked forever there is no way back - on that, I entirely agree with Mr Salmond. "I do not believe most Scots will enter that room. For the faults of the present, flawed system of democracy we have the majority, the great majority will stay with the best of both worlds. "Scots want a Scottish parliament with more powers doing more things, but within the larger family of the UK." But Independent MSP Margo MacDonald said independence would make Scotland better, adding: "It may well be that there was an argument at one point for the total community of the United Kingdom having one economy. "There isn't now, there's too much of a difference. Particularly between the south east of England and the rest of us." And Green MSP Patrick Harvie, whose party also back independence, said: "The prospect of taking responsibility for areas such as welfare, taxation, defence and foreign policy opens up the possibility of real change, while a 'No' vote does not." The debate came as one of Mr Salmond's former special advisers raised concern that the SNP leadership had so far relied on winning hearts, without enough focus on winning minds. Writing in The Guardian newspaper, Alex Bell, a former Scottish government head of policy who worked on the independence white paper for two years said: "The campaigns to date have been a tedious parade of union flags versus saltires, of pop identity about caring Scots versus heartless Tories. What do young voters want their country to be like in 10 years' time? "By insisting on something particular to Scotland and contrasting it to the UK, Salmond has denied a crucial truth about the debate: Scotland's problems are common to the developed world, and the questions for him are the same as those for David Cameron and Ed Miliband." Responding to his comments, Deputy Scottish First Minister Nicola Sturgeon told BBC Radio's Good Morning Scotland programme: "With the greatest respect to Alex - (someone) I think very highly of - I'm responsible in government for the white paper, and when the white paper's published in November, I think it will set out - I know it will set out - a very strong case for independence." Meanwhile, the official campaigns for independence and the Union - Yes Scotland and Better Together - also marked the day. Yes Scotland chief Blair Jenkins, said: "Scotland has generated more tax per head than the UK as whole in each and every one of the last 30 years. "The question is, why more people in Scotland are not reaping the benefits of our wealth? Former chancellor Alistair Darling, leader of the Better Together campaign, countered: "I hope that the nationalists will be prepared to give people answers to the many question that they have about the impact of going it alone on our jobs, our pensions and our public services. "Up until now every one of these legitimate questions has either been met with calls of 'scaremongering' or with a blind assertion."